Apple is widely considered as the #1 innovative company in the world. The company’s innovation strategy involves terrific new products and innovative → business models. But the shift was not only a matter of product innovation. 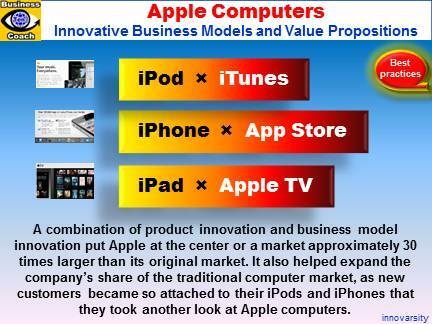 Innovation lies also in Apple’s innovative business models – new synergistic ways to → create, deliver, and capture value. For instance, the iPod and iPhone would not have had nearly as much impact if they hadn't been matched with iTunes and the App Store respectively. → Systemic innovation integration is at the heart of Apple’s success. Apple works across traditional industry boundaries to create a successful innovation-friendly ecosystem. The company is in hardware, in software, in entertainment, and in logistics, and have mastered parts of all those industries. The App Store, for instance, the world’s largest collection of mobile applications, offers hundreds of thousands ways to make iPhone even better. iTunes, innovative software with a powerful business model, shows that people would pay for music if the price is right and the interface is simple enough. Apple’s innovative → value proposition “The product as an experience” stimulated great ideas when company leaders were contemplating a new business model. For instance, Apple pioneered into a new business space and defined a workable business model for downloading music. Another key driver of Apple’s → financial success is growing adoption of Apple products for business use. Saving time and minimizing frustration are the essence of Apple’s brand promise. This value proposition converts PC and Blackberry users to the Apple brand. Apple's innovation strategy also involves great in-store service.